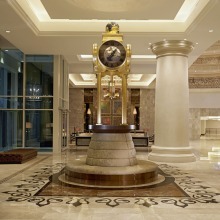 Americlock completed another ionic clock for the Waldorf Astoria in Dubai United Arab Emirates on the Palm Jumeriah. 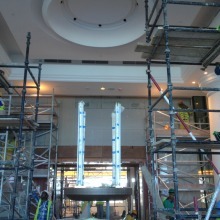 Americlock was approached by Al Habtoor to design, fabricate and install this clock at the new Waldorf Astoria. After flying halfway across the world to meet with the hotel designer and engineer we were able to gain inspiration from the surrounding lobby for this clock. Using high quality brass, bronze, gold leaf, nickle plating, and brushed stainless steel, this clock started to come to life in our St. Louis workshop. This clock stands 3 meters tall or almost ten feet tall and is topped with a hand laid gold leaf globe with raised continents. The clock faces are set behind glass and have a nickle plated custom design which closely mirrors the pattern in the marble on the floor surrounding the clock. Below the custom clock faces are four rotating gold leaf balls which slowly turn adding another intriguing element for visitors of this iconic hotel. Roped brass poles surround each one of the brass legs supporting the clock in place. When the customer was ready for the clock, we crated this timepiece in a specially built crate ready for the overnight journey to Dubai. 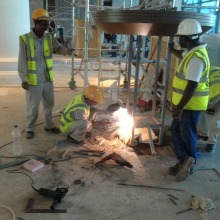 In only 23 hours, this clock left St. Louis and arrived on site in Dubai for installation. Arriving on site we worked closely with the hotel finishing company to build the metal frame properly in order for the clock to sit on the custom wood base. Once the brass supports were securely fastened onto the custom base, it was time to raise the clock into place. 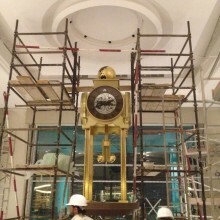 The workers quickly erected a makeshift gantry to lift the 300 pound brass clock top into place. Once in place, we had to bolt everything into place. Once secure, we worked to run the electrical wires to the clock working with the local electrician. Working late into the night we finally finished to meet the deadline of the customer and turned the clock on giving the Waldorf Astoria its iconic lobby clock.